Addicted to Rubber Stamping: Trick or Treat? Well, as far as I'm concerned, anytime Doodle Pantry is involved, it's a treat! I have no idea why, but I absolutely love making Halloween cards. Here is my first for the season. 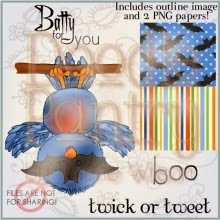 For this card, I am using an older digital stamp set from Doodle Pantry called Bat Birdie. Isn't this upside down birdie adorable? I printed the image on white card stock and then colored it using Copic markers (bird body - YG17, YG23, YG25; beak & feet - YR16, YR23; branch - E31, E33, E35, E37; mask N3, N5, N7). The mask was then layered with Fantastic Glaze to make it shiny. The card is a 3-layer cut file from Silhouette's online store. I used orange, black and lime green card stock to cut this file. After the layers were glued together, I used orange and black Stickles Glue along the edges. I finished the card with black bats from a punch by All Night Media. Here is a preview of what you get in this set. That is so cool and love those colors. I am a bit stumped as to what I really want to do for Halloween so keep inspiring me. For my church people they don't want me to use witches or ghosts, especially for those in the nursing home. I guess they figured ghosts might remind the elderly too much of their soon demise. LOL So usually I do pumpkins but this is sure cute! That Bat Birdie is way too cute! You can't go wrong with that color combo. It's one of my favorites. I love how you added the stickles glue to give it more interest. So pleased you chose to share it with us at 613 Avenue Create. Wow, what a knockout design, Susan! Great coloring of the birdie, too! Love how this turned out, Susan! Thanks for playing along with us at the Simon Says Stamp Wednesday challenge! I find Halloween cards fun to make too and a while back made one with this bat, yours is quite delightful. Fabulous designed too! Thank you so much Susan for sharing your lovely creation with us at Brown Sugar Challenge this week. Cute bat birdie! And love the layers of dripping, so perfect for Halloween! Love it! A great card. Thanks for joining us at Crafty Girls. What a GREAT card! Just love it . . . and It's just perfect for our "any holiday" challenge over at HIMCR this week. Thanks so much for joining us!!! Good Luck!! !